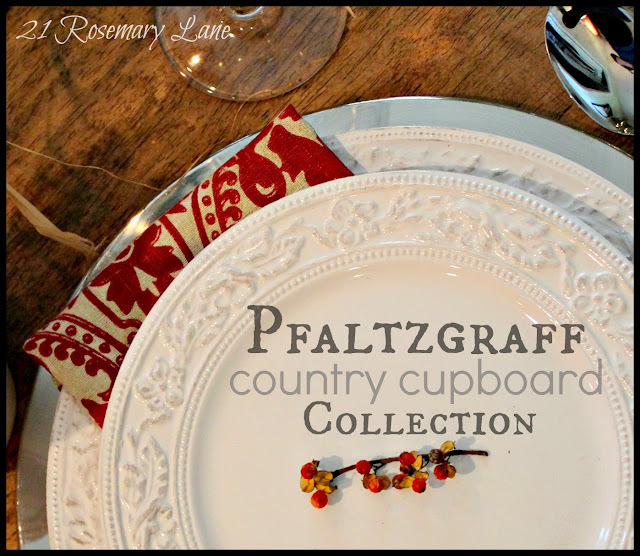 Today I am extremely excited to be able to share with you this homespun inspired Country Cupboard dinnerware from one of my favorite dishware companies Pfaltzgraff. 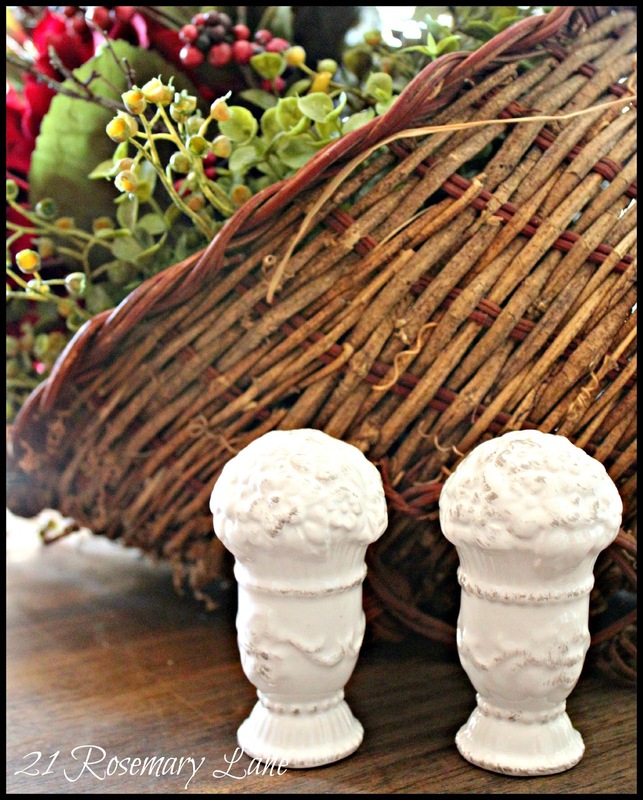 The Country Cupboard collection is not only incredibly pretty but is also very versatile. The style and color of this set make it perfect for casual everyday use and yet is still elegant enough for more formal occasions. I love the classic atique look of this pattern with its beautifully distressed edges. 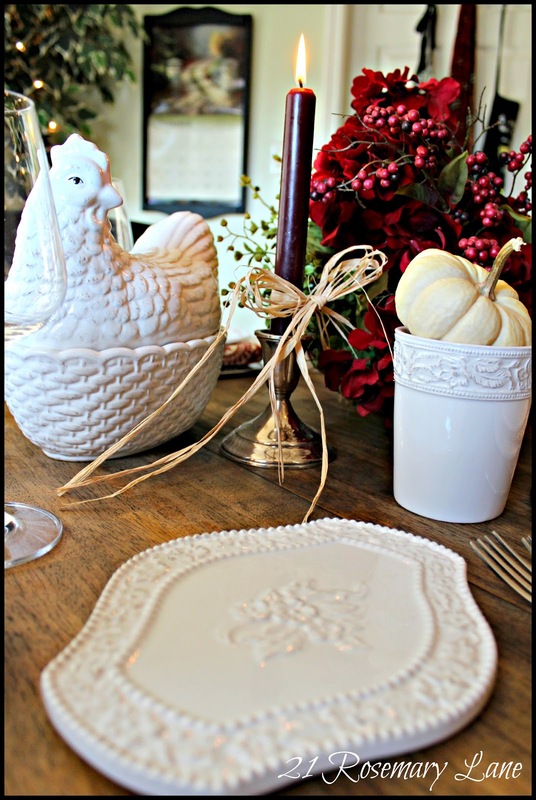 So since we are less than 2 weeks away from turkey day, I wanted to create a festive Thanksgiving tablescape for my newly revamped kitchen using these gorgeous pieces. The full place setting is comprised of a dinner plate, one salad dish, a soup bowl and a generously sized mug. 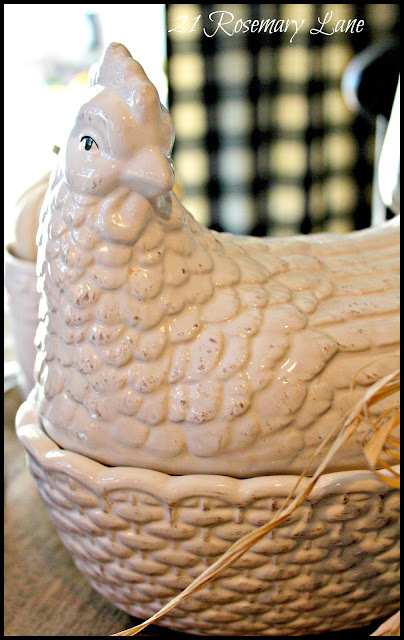 Oh and I do not want to forget to mention this charming rooster canister. 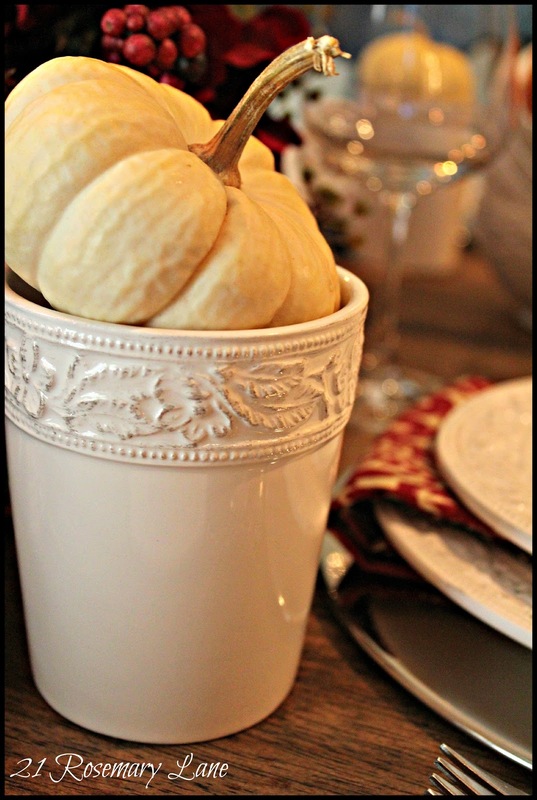 It's the perfect place to hold yummy dinner rolls for a holiday meal. I have to tell you that I am truly thrilled with this collection. Not only does this pattern beautifully compliment my freshly refinished rustic kitchen table, but the plates are nicely weighted and all pieces are both microwave and dishwasher safe. OK, now for the best part...Pfaltzgraff is offering one of my lucky readers the chance to win a 32 piece, yes you read that right...a service for 8, of their Country Cupboard dinnerware. Isn't that amazing? There are a few ways you can enter this giveaway, just be sure to leave a separate comment for each entry. 1. Like and subscribe to Pfaltzgraff's Facebook page. To take this step click here. 2. Leave a comment letting me know why you would like to win this beautiful dinnerware. 3. Blog about the giveaway with a link back to the giveaway and/or add the giveaway button below to your blog's sidebar. And that's it! Remember each comment is one entry so you have up to four chances to win this Pfabulous Pfaltzgraff dinnerware! The giveaway begins today and will be open until Sunday November 18th at midnight. A winner will be drawn on the day before Thanksgiving, November 19th, and the winner's name will be announced in a post that same day. Wishing all who enter the best of luck and to everyone, have a fantastic week!!! Love these dishes !! Ive had a few of their patterns , but these are my new favorite and the chicken ! !Please enter me ! 2nd entry for following you ..Love,love,love these dishes! I would just love to have these pretty dishes, the S&P's are adorable! Oh my I love this pattern! I would love to win this...my weakness beautiful dishes and these fit the bill, they will match with anything...Please enter me and thanks! Posted giveaway button on Hibiscus House and Dolly Is Cooking! 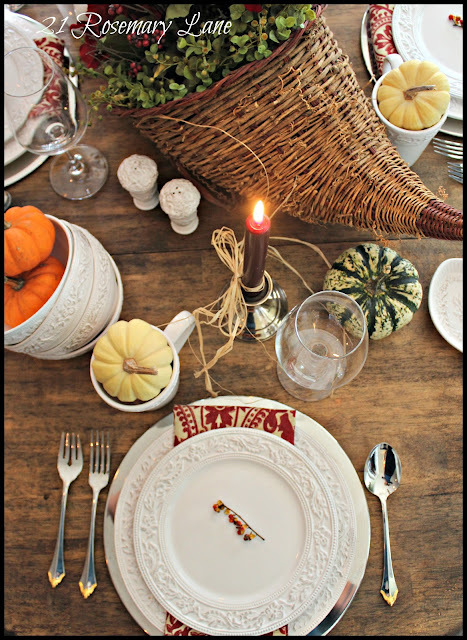 This dinnerware is so fabulous! I would enjoy using these for any occasion or everyday use. I liked Pfaltzgraff's FB page! Would love to own these dishes! They would look so pretty in my kitchen!! Liked on facebook also. Thank You & have a great veterans day!! Beautiful! Your photos show them off just perfectly! I have the Winterberry collection and just it! Please enter me in the giveaway! Went over and "liked" the Pfaltzgraff Facebook page. I would love to be entered for the contest. I was raised on Pfaltzgraf. My mother had the Yorktown pattern that she put together piece by painstaking piece. My pattern was Folk Art and my mother helped me collect the pieces. Unfortunatly, I had to sell them about 9 years ago. I id manage to keep one or two pieces like the pie plate and my favorite covered casserole dish. Since my mother passed away the Yorktown pattern of my mother's is now packed away for my daughter when she gets married. I think there are three giant containers of it. I always loved the heaviness and quality of the dishes. Much better than anything else you can find out there. Best wishes to all...Happy Holidays. Thank you for the opportunity to enter the contest. I just blogged about it over my blog Cranberry Horn Vintage. I wish you all a very happy holiday! I have "liked" Pfaltzgraff on Facebook. 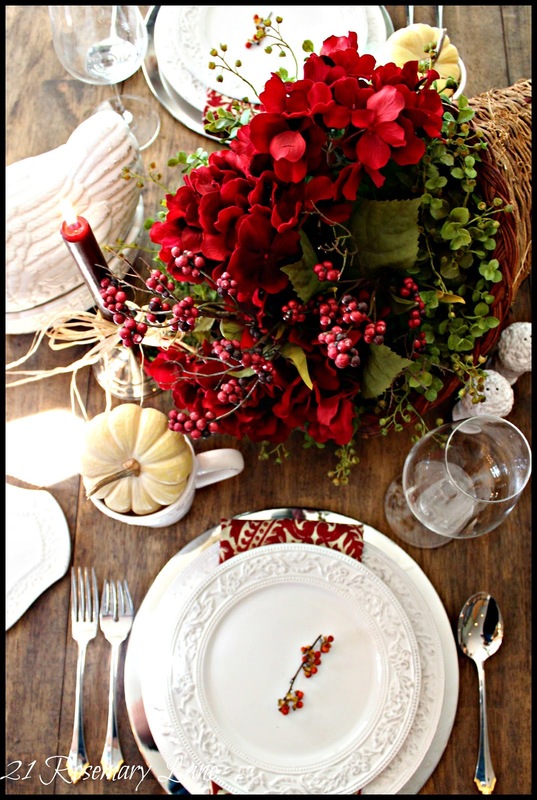 Barbara, I would LOVE to add these dishes to my collection and create many more tablescapes. They are beautiful. Thanks for the chance to win! I posted the giveaway on the sidebar of my blog! Thanks for a chance to win! Pfaltzgraff pottery brings back fabulous memories of college days. I had always LOVED the pottery, but was a poor student back then. This set has a beautiful time worn look. Beautiful in any setting. JUST LOVE IT! Thanks for your super blog. I would love to win this give-a-way. This is a timeless and classic pattern that could be used for multiple occasions for many years to come. Thanks for the opportunity. Also liked Pfaltzgraf on Facebook. Thanks. I would love to win this dinnerware. I am so tired of my Corelle Ivy that I have had for over 20 years. I have also "liked" Pfatzgraff on facebook. Hi Barbara, just one entry for me. Don't use twitter or facebook. Just one happy follower. Thanks for the opportunity. Love that pattern. I liked Pfatzgraff on Facebook. I would love a new set of dishes. Mine are servicable but sad. I am a new follower as a week or two ago. But you don't have to use that as an entry. I think those dishes are charming! And the canister is beyond! This is something I would truly enjoy owning. I'm going to try to add the give away to my blog. LOL Does four followers even constitute a real blog. Love yours! Oops! I think I did that wrong. I should have separated those. Oh, well! I would like to win because I know Pfaltzgraff makes great quality dinnerware and this will be a set that my family will use and appreciate for years to come. Have been looking for new dishes and these are perfect. I liked on Facebook. What a beautiful set of dishes. They are so me! I absolutely love them. Thanks or the chance to win them. I liked Pfaltzgraff on Facebook. Thanks! I would use these in my rustic farm-inspired kitchen to play up the old time theme, as well as serving as a gorgeous backdrop to food! I just signed up as a new blog follower. These would be great for our Thanksgiving table. I'm a new follower! Love your site and tips and ideas. Would love to win this beautiful new "old" pattern of Pfaltzgraff dishes. Ooh, what a great giveaway! I'd love to win these dishes as they would go with anything!! I like Pfatzgraff on facebook. I would like to win this set to replace our mix-matched set. It's a beautiful set. My wife would be thrilled. I follow 21 Rosemary Lane. This pattern is so pretty..I love everything about them. I have never personally owned an Ptatzgraff. My grandmother and mother in law do. They love their sets. I like 21 Rosemary Lane on FB. These dishes are beautiful! I love the color and pattern! I follow 21 Rosemary Lane!! I have had the pfaltzgraf pattern of heritage for many years, and never do tire of it, the classic color goes with everything and this new pattern would be the same and modern and oh so pretty. It would make one proud to serve with it that is for sure. Love it. I would absolutely be so EXCITED to win this 8 pc. I have such a love for all things kitchen and dining. I have liked and subscribed through facebook, posted on my blog about the giveaway and I am a follower of 21 Rosemary Lane. Please Please pick ME! The dishes are beautiful and love the fact that they are practical too, dishwasher and microwave. 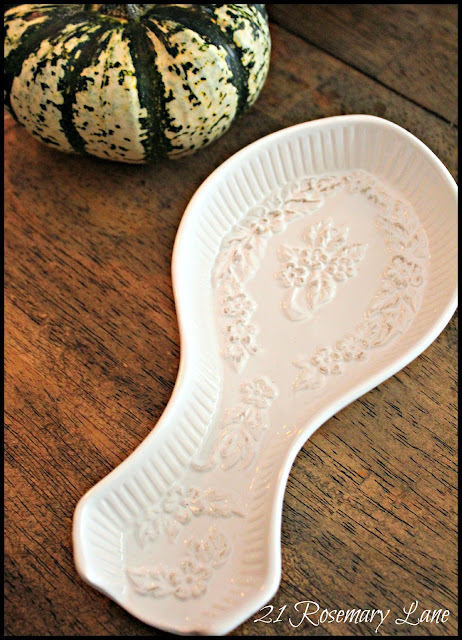 I have a cabinet full of dishes already but they would make a splendid gift! What a wonderful giveaway. I went and liked pfaltzgraf. I am a follower of yours and love your blog. I could really use these dishes since I only have one set now and need to get another. 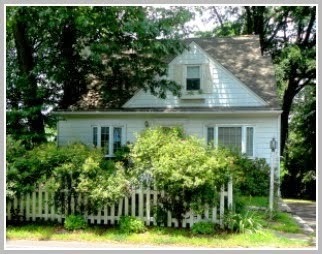 My tastes have changed in the last few years, and now wanting a more comfort style home. These dishes would be a great start. I have also liked them on FB. I will enjoy following them. Barbara, These are just gorgeous white dishes. Right up my alley! You did a wonderful job showing them at their fall best!!!!! STUNNING! I would love to win this giveaway!!!! I am a happy and faithful follower!!! I would love to win this dinnerware because I am newly married but we still don't have a complete set of dishes! hah. also these dishes are LOVELY. Following 21 Rosemary Lane as a new follower! Love their dishes. My husband and I had some Pfaltzgraff dishes when we got married and we got rid of them after 13 years and I miss them every day. They are the longest lasting dishes ever. I just signed up to be an email followe, love your blog. Love this set! Beautiful! Would love to win as I love to entertain and this would be such a nice addition to my dishes. Just found your blog - beautiful job presenting these dishes - love your table setting! These dishes are beautiful. I have always wanted a set of Pfatzgraff dishes & these are the prettiest ones I have seen. This is a beautiful pattern.. .ove the chicken.. I would use these dishes for everyday. My food would look delish on these plates! Love this dinnerware. I would be so happy to set my table with it!! I'd love to win the gorgeous dinnerware Barbara. They would be a wonderful addition to my home. I just liked Pfaltzgraff on facebook. I love your blog I am a new follower. I also liked the Pfaltzgraff Facebook page. 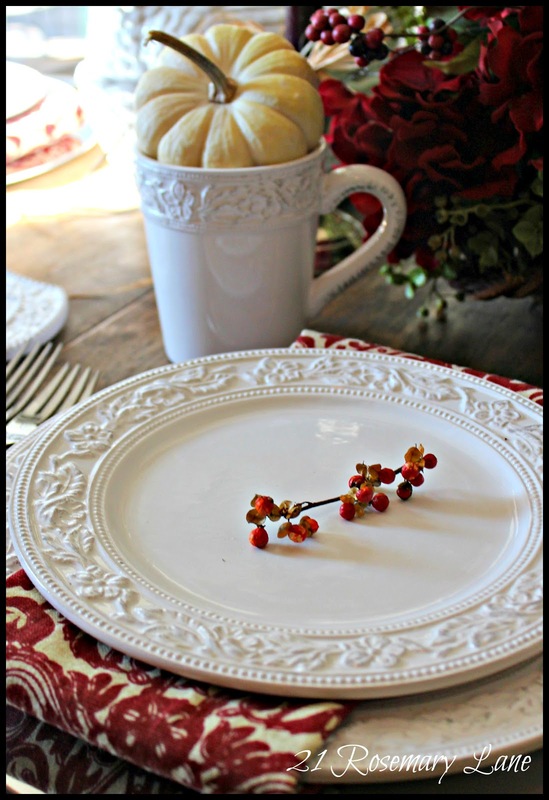 I would love to win this beautiful dinnerware. Beautiful! My older white Pfaltzgraff plates are getting worn. Would love a new set!These wold work with my vintage dishes as well! Just became a follower also! 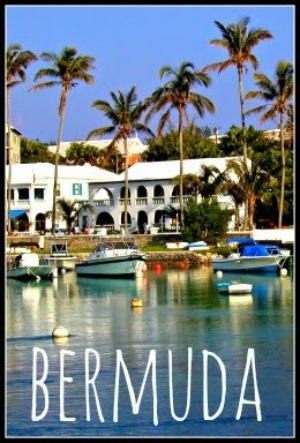 Very pretty blog! Loving that burlap wreath! Hi I will love to win this dinnerware I live in an apartment and just converted a a spare room into a dining room since a friend of mine gave me her dining room set. This will look great since I'm decorating it french country beside the fact that i have no dinnerware for the table. Love the rooster. 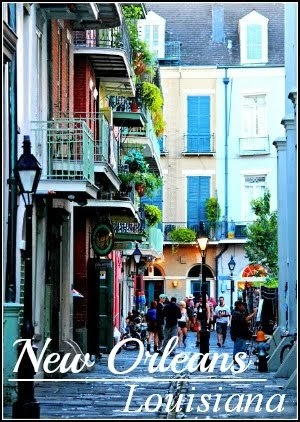 I just started following yor blog. 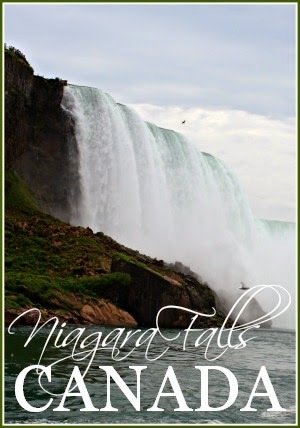 I am new to your blog thru Wow us Wednesdays! The white dishes caught my eye. I would love to win this set because I don't have a set of white dinnerware. I have many patterns but no white. I am married 36 years and yet no white dishes! Don't know why but maybe I was waiting for the right set and this is the one! It is beautiful and I love the details..The trivet is fantastic..you don't see these with other sets! 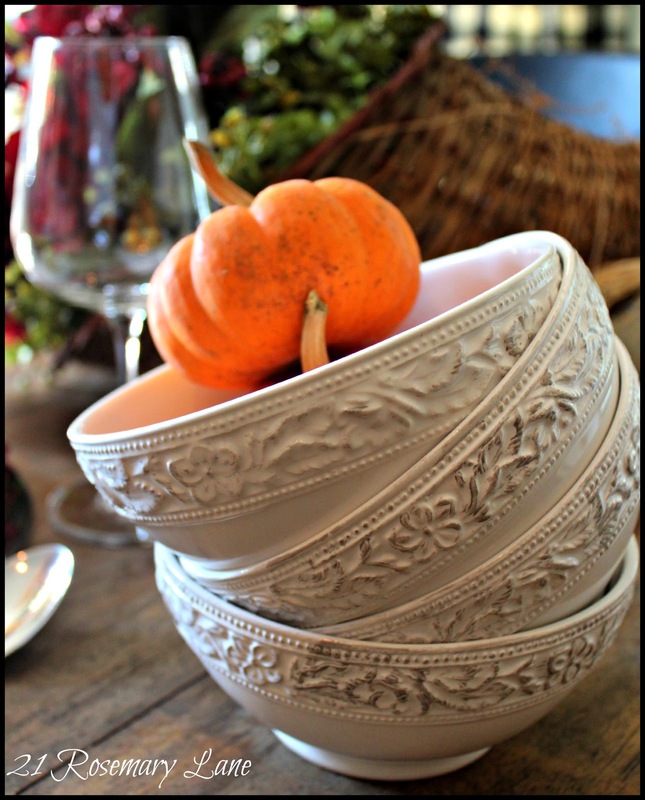 Count me to win this beautiful set of white dishes..love the pattern, the details are stunning and I like all the accessories as well. I just became a follower as well! Hi there! This is a beautiful blog, I can tell you are a big fan of DIY projects and helping others appreciate what they have by sprucing things up! I'm getting married in February (just 3 months to go) and my fiance and I are trying to put together a warm celebration for our guests. We are actually collecting dishes for our reception, and attempting to do it for a small sum of money. Therefore my (gracious) mother and I have been asking to borrow, searching creigslist.com, and perusing thrift stores looking for the best deals. FREE is obviously the best deal one can get, so I can say with confidence that these dishes would be of great benefit and well used, and hopefully either kept or passed on to a loved one's home afterward. Thank you for posting this! Happy Thanksgiving. I liked Pfaltzgaff on Facebook. I would love to have this set of dishes as they are so versatile and can be changed for each season to look like a completely different set of dishes, just by changing out the accessories. Oh, my old V&B Manior is no longer available! I would love this mixed with my beloved everyday set! Hooray I'm a new blogger follower! These dishes are gorgeous and I am in such need of new dishes. These would be so handy to have because they would be suitable for any season. Would love, love, love to win these. I am in such need of new dishes for everyday use. Love Pfaltzgraff dishes! I can't get enough. I started with Yorktown, sold my sister and sister-in-law on Pf, and later bought a winter set. I absolutely love this country set and would be over the moon to win it. Fingers crossed. . . I so love Pfaltzgraff dishes. My first ones were Yorktown and have bought several sets since 1975. I absolutely love the new country set and would be over the moon if I won! Crossed fingers. I had already like Pfaltzgraff on Facebook awhile ago!! I would LOVE to win these because just today I found a VERY similiar set at Horchow but don't want to spend the $$$!!!! I adore these and never saw this pattern before. I never win anything, but the pflaltzgraff is really pretty! I never win anything, but I thought I'd try since these dishes are really lovely. I'd like to enter on behalf of a friend of mine. I doubt this giveaway is opened to all!!!! I am entering on behalf of a friend who was badly affected by Sandy and this would definitely cheer her up. I'm already a follower, but just wanted to say "Thanks" for this wonderful give-away! I just love dishes. No other reason than that! I liked Pfaltzgraff on FB. 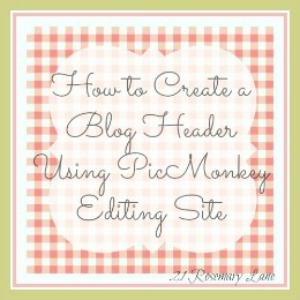 I've copied & am headed back to my blog to paste the button on my sidebar! Amazing to see that I have the same dinnerware. Have a nice day & enjoy your Thanksgiving. I am a new follower and I voted for you on Picket Fence. I will have to ask later what that is all about. Barbara, Thank you and Pfatzgraff for offering this awesome giveaway. I have posted your giveaway button on my "Savannah Granny" sidebar. I am crossing my fingers, legs, toes and eyes, hoping I will win. Gosh, I even worked my nose out of joint, but not in a grouchy way! I have liked Pfaltzgraff's Face Book page! This is an absolutely wonderful giveaway. I've never won one before! I would love to be the winner! Have a great weekend! Wow! What a wonderful give away and the embossing on the china is gorgeous! Someone is certainly going to be pleased with this set and the extra pieces are lovely especially the trivet. Please enter me into your giveaway! Now following you (how have I missed your blog before now???). Pfaltzgraff makes such elegant, classy dinnerware. I would love to use this set to serve those who are nearest and dearest to me. 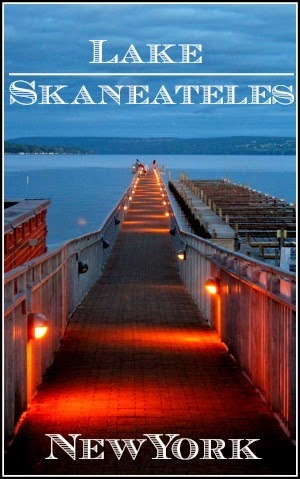 I follow you via email (aneesa824@yahoo.com) as well as on Facebook (Aneesa Bint Lewis) and Pinterest (aneesalewis). Love these dishes!! They are so pretty and would be a great replacement for my 1980's stuff that is looking kinda worn out. I would love to win the dish set because they are so beautiful and would look great in my kitchen! I liked them on FB and I signed up to be a new follower of your blog! I hope to win! I truly LOVE these dishes. My weakness is beautiful white /cream dishes . I had a plain set that I liked very much, but over the last five years (since I got my two grandsons 5 & 9 now) I have lost most of it and cant replace it. I liked them on FB and I'm a follower of yours. Boy I hope I win!! I Love your blog, it makes me happy!! I am a true follower and I thank you. Well done. I liked the Pfatzgraff dinnerware on facebook, and came back here to leave my comment..but I guess I fail at being able to post a button, as I do not know how to do that, and I am not a blogger,just a follower of yours, but I loved the dishes anyway...Happy Thanksgiving..
Love this pattern. Please enter me to win a set. Thanks!